For almost 30 years SHD ITALIA designs, manufactures, markets and installs, in Italy and abroad, prefabricated operating rooms, intensive care units, dialysis units and central sterile services departments. Our specific self-loading wall cladding modular systems ensure an optimal and flexible performance of all hospital departments requiring controlled bacterial contamination. Thanks to the expertise SHD ITALIA can deal with new construction projects or hospital and clinic refurbishments. A skilled design team assists the designer in writing the specifications and provides the customer with the project management. We make our know-how available through every phase of the construction process. SHD ITALIA constantly develops and improves its products in order to achieve better, innovative and high quality solutions. 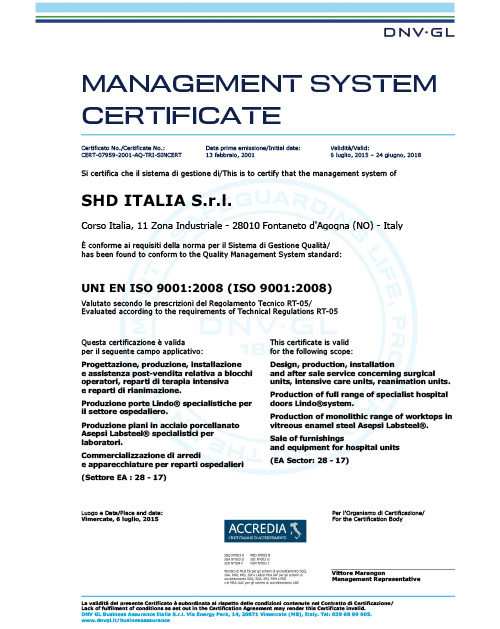 SHD ITALIA is ISO 9001 certified since 2001. Sorima Group is founded in Milan and operates in the civic infrastructure and healthcare sectors. Thanks to the successful application of the vitreous enamel steel the company distinguishes itself from the competition. - Casa di cura Città di Piacenza S.p.A. (Piacenza), first healthcare project in Italy: surgical unit composed of 3 operating rooms. - Poly hôpital de St. Jean de Luz (Paris - France), first healthcare project in Europe : surgical unit composed of 3 operating rooms. - Casa di cura Villa dei Fiori (Marano – Naples), first I.C.U. project. - Ospedale Internazionale di Napoli, first dialysis unit project. - Cristo Re delle figlie di nostro Signore all'Ospedale Monte Calvario (Rome), first C.S.S.D. project. The company moves from Piazzale Loreto (Milan) to Dormelletto (Novara) founding the Sorima Hospital Development division following the increase of interest for the products in the healthcare sector. Sorima Hospital Development awards the first tender for the Istituto di Candiolo – IRCCS (Turin). 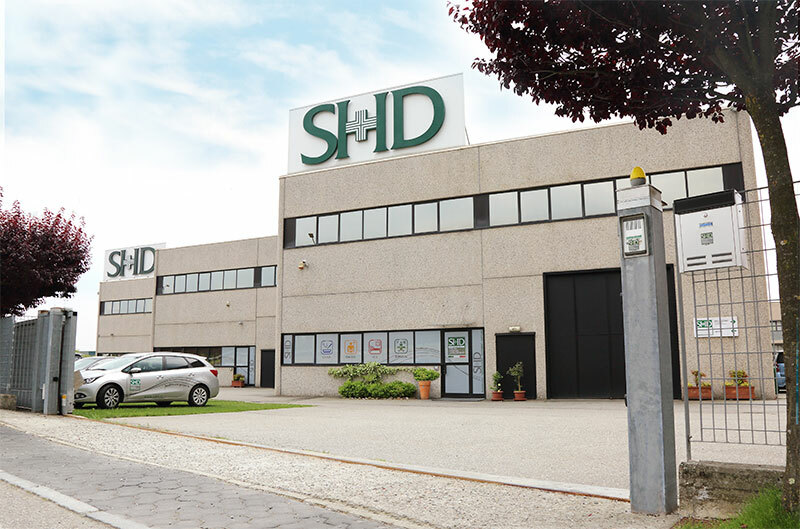 Following the success of the Sorima Hospital Development division, the shareholders decide to push the development in the hospital sector by establishing a dedicated company: SHD ITALIA Srl. SHD ITALIA gets the ISO 9001 certification. SHD ITALIA moves from Dormelletto (Novara) to Fontaneto d'Agogna (Novara), near the highway exit of Borgomanero (A8 - A 26 - E 62), in a brand new facility of 5,500 sqm. Libyan Swiss Diagnostic Center (Tripoli – Libya), first extra-UE project for a surgical unit. Dubai Healthcare City Centre (UAE), first hospital project in Middle East: surgical unit composed of 4 operating rooms. Prince Court Medical Centre (Kuala Lumpur – Malaysia), first hospital project in Far East: burns and emergency departments composed of 3 operating rooms. Decaire Clinic (Montreal – Canada), first project of surgical unit in North America. Facility enlargement and insourcing of production plants. 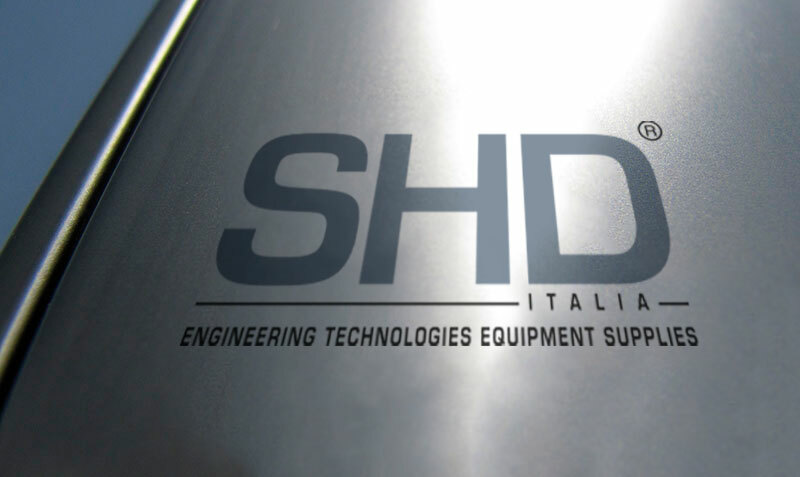 At SHD ITALIA we put our production facilities, know-how, experience and network of experts at the service of our national and international customers. The key to our success is the cooperation, not only among ourselves, but also and especially with our suppliers, agents, customers and the key people in the healthcare markets we serve. Our global vision is to be a leader worldwide in the healthcare market thanks to our cutting-edge solutions in the field of hospital and laboratory construction.